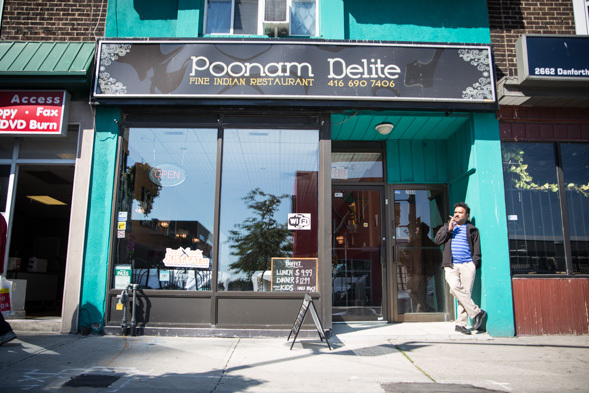 Poonam Delite has been around for over 20 years on the far east end of the Danforth . 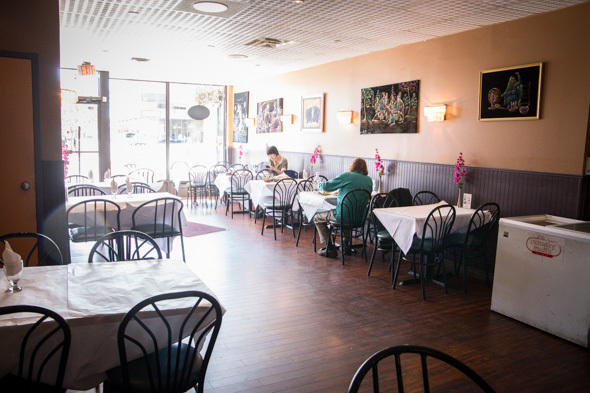 This family-run Indian restaurant is a staple spot for locals in the area and has a real community feel, with some regulars coming in a few times a week for the affordable lunch buffet. 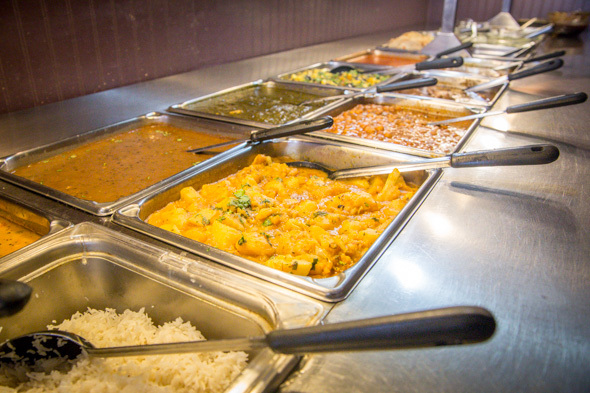 Gurnam Singh, or Mama Singh, as she is popularly called, has been cooking homestyle Indian food since she was 10. Originally from the Punjab area of India, she learned how to cook as a rite of passage growing up around her relatives, who worked in the farming industry (when she retires, she wants to go work on a farm). When Singh moved to Canada at the age of 16, her father owned an Indian restaurant on Gerrard in Little India , and eventually, she followed in her father's footsteps, entering the restaurant biz. 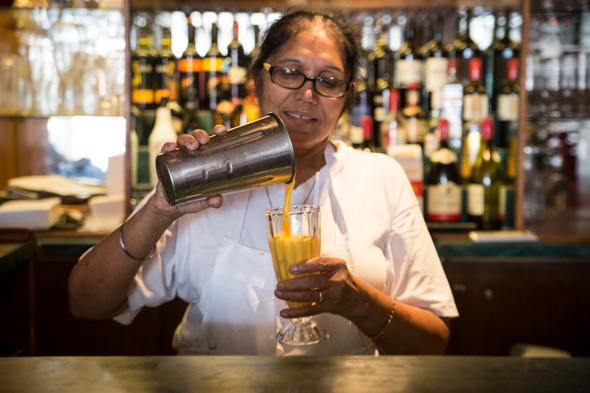 Poonam Delite still keeps it in the family, with her son Gorby helping her run the place, as does her husband Kenny (who used to own a bar popular with the locals in the neighbourhood). 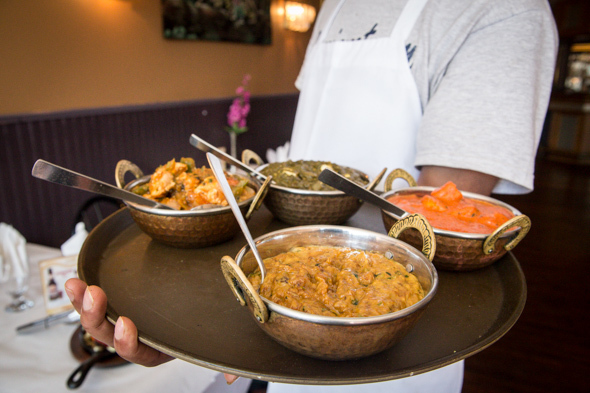 With over 50 years of cooking experience, Mama Singh knows what she's doing. 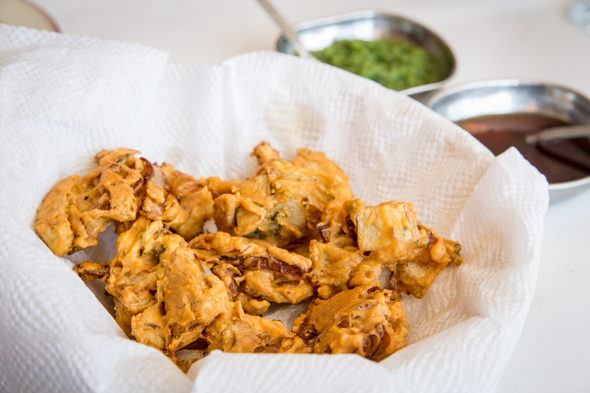 Everything here is made from scratch (except the mango chutney) with natural ingredients, including the sweet tamarind and mint chutneys for the vegetable pakoras ($3.50), which are flavourful pieces of deep-fried goodness that live up to the title of appetizer. 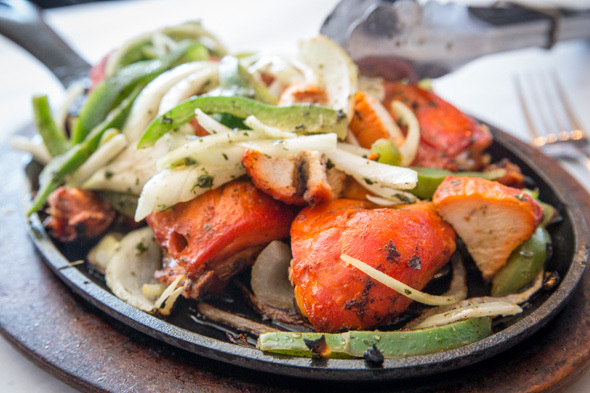 A sizzling tandoor platter contains moist tandoori chicken cooked in a clay oven, along with chicken tikka and veggies ($14.95), and contains a heck of a lot of meat. Vegetarians can get the paneer version ($9.95) - Mama Singh herself mostly eats veggies (her son has to force her to occasionally eat some chicken). 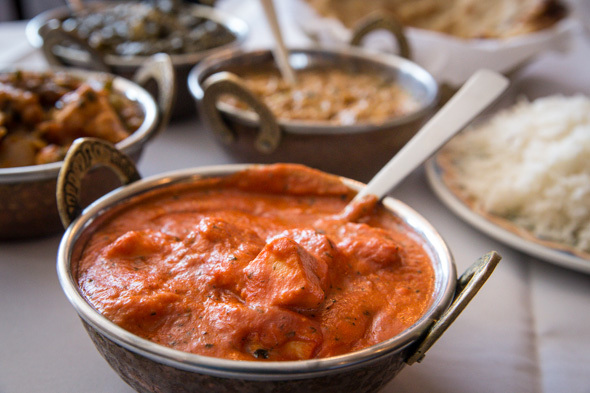 Indian cuisine typically offers a lot of vegetarian options, like saag paneer ($7.99), a mixture of homemade cheese cubes in a spinach sauce, which takes six hours to prepare and is a family fave. Unlike some other restaurants, the sauces here do not contain any cream (with the exception of butter chicken) - the spinach itself is creamy enough. Meanwhile, baingan bhartha ($7.99), a roasted mashed eggplant dish that's a Punjabi classic, is something I've never tried before and has just the right amount of spice to make it completely addictive. Then there's Poonam Delite's most popular takeout item - and, likely, every Indian restaurant's bestseller - butter chicken ($10.50). It's easy to see why it's a crowdpleaser, as the flavours are a perfect combo of rich and creamy - and, like all the dishes I try here, contains the perfect balance of spices and heat. A side order of butter naan ($2.50) or basmati rice with saffron (a bit pricey at $3.50) are the ideal accompaniments. Homemade gulab jamun ($2.25), round balls made of milk powder doused in a honey syrup, and a cup of masala chai ($1.50), a spiced milk tea, make for a satisfying dessert. That, or a glass of freshly made mango lassi ($3.50). To sample a wide variety of offerings, the all-you-can-eat buffet is a good deal ($9.99 lunch, $12.99 dinner), especially for lunch. Kenny explains that "poonam" means "full moon" in Hindi, and that in India, its beauty makes everybody happy. Mama Singh tells me her "poonam" is cooking. "I love to cook," she says. "Every day I come I'm happy here."